Each $108 box contains 30 packs. Each pack contains 5 cards. 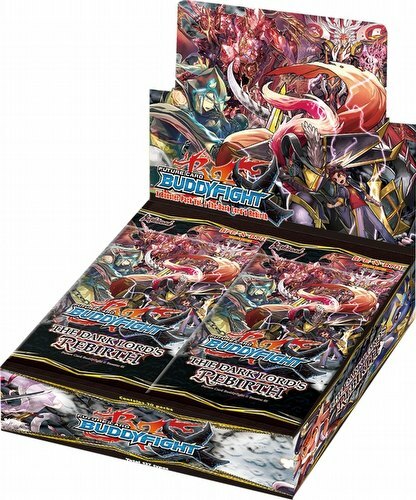 Future Card Buddyfight: The Dark Lord's Rebirth boosters include cards used by the new characters in the latest season of the animation. Recreate decks used by the characters or create your own decks. What's more, The Dark Lord's Rebirth booster packs also include cards used in the final stages of the Triple D animation. A limited edition promo card is included as a box topper in each display. There are 6 different promo cards available. The primary worlds featured in this set are Dragon, Star Dragon, Katana, Ancient, and Dual. There are 122 different cards plus Secret cards (3 BR, 6 SP, 8 RRR, 12 RR, 33 R, 30 U, and 30 C). Some cards are reprints. Each box contains 30 packs. Each pack includes 5 random cards, one of which is a R or better. One Secret pack can be found in each box. Parallel foil versions of commons, uncommons, and rares are randomly inserted.